What Can We Learn from Craters? Craters are scars left on the surface of a planet or moon, formed by meteorite impacts. These scars can tell us a lot about the geology of the planet or moon and they are usually very prominent. If you look at the moon, you can see dark and light areas. Those dark areas are craters on the moon’s surface. You can estimate the size of a meteorite from the dimensions of the crater it leaves behind due to the laws of physics (which I won’t get into here), so finding craters can be very informative about the history of a planet or moon. Here it is from the air. 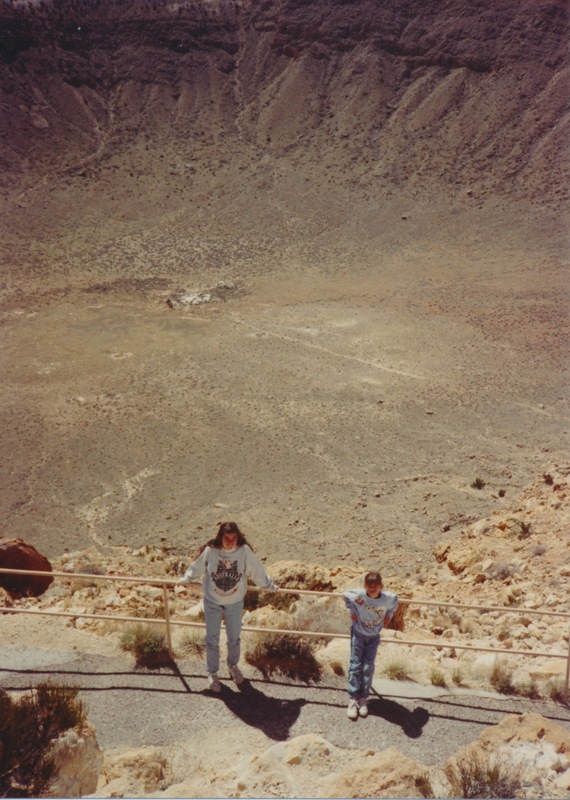 Here I am (right) with my oldest sister (left) at the edge of the crater many years ago. You can visit it, too! And it’s comparably small at 1200 meters in diameter and 170 meters deep. It formed around 50,000 years ago from a meteorite about 50 meters in diameter. 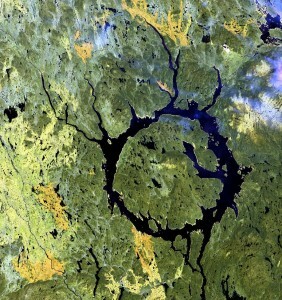 Another example is Manicouagan Crater in the Côte-Nord region of Québec, Canada. It’s 100 kilometers across, contains a ring-shaped lake and an island. It formed around 215.5 million years ago from a meteorite about 5 kilometers in diameter. The crater from the meteorite that killed most of the dinosaurs was difficult to find because it’s partially buried by younger rocks and partially underwater. The crater formed 66 million years ago, is 180 kilometers wide and was formed by a meteorite 10 kilometers in diameter. It is located in the Yucatán Peninsula of Mexico. We’ve known about the crater since the 1970s from data captured by a Mexican oil company, but have not been able to explore it in depth until now. Data captured by a Mexican oil company showing the structure of the crater. 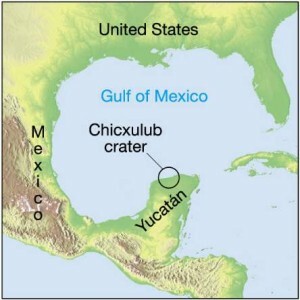 The data on top of a map of the Yucatán Peninsula showing the size of the crater. This week, an exploration launched to drill into the crater and take core samples of the rocks. 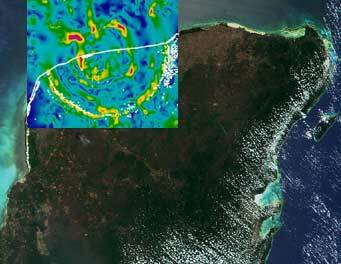 The expedition is led by scientists at the University of Texas at Austin and the Imperial College London. Drilling into 55 million year old rocks (during the Paleocene and Eocene, the warmest time in recent Earth history) above the crater itself to understand the effects of high levels of CO2 in the atmosphere and apply that to current global climate change issues. Drilling in the sediments above the crater, to see how animals moved back into the area once the Earth stabilized. Drilling into the crater to understand what the meteorite strike did to the Earth’s rocks and apply that to impact effects on other planets. The expedition will last until June (2016) and will deeply impact our knowledge of geological and life processes on Earth and other planets.